Playing for Pancho Villa is an enjoyable book set during the Mexican Revolution. 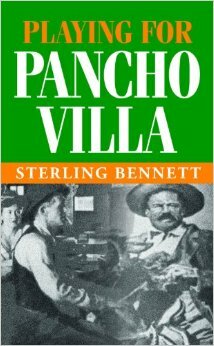 American author, Sterling Bennett, has clearly researched Mexico very deeply to produce this exciting novel bringing to life the war between the Mexican Army under Carranza, Pancho Villa’s division and the US Army under Pershing. Bennett, who lives in Mexico and has done for many years brings together his observations of the country to provide a haunting account of one man’s adventure to another culture, another world. Frank Holloway, the book’s main character, is brought to life in Chihuahua in northern Mexico, brought on by his desire to get some relief from mercury poisoning. We meet Mr. Wu, Juan Carlos the young doctor and Doña Mariana who are brought together by love and fear as the group travel the state, hiding from enemies and exalting in each others' company. At times, the author exoticises Mexico somewhat in chaos and violence, however the world he brings to life is so haunting, it captures the reader’s attention and will hold you until the end. Support the author and Editorial Mazatlan and buy this book today!